Cooper was born in Philadelphia and began his studies at the Pennsylvania Academy of the Fine Arts in 1879 under Thomas Eakins. Like many of his contemporaries, he continued his studies in Paris at the Académie Julian and upon his return to the US taught at the Drexel Institute. From 1880 through 1898 Cooper lived in Philadelphia and exhibited some 48 works at the Pennsylvania Academy of the Fine Arts. Among the works were: Behind the Barn (1880); The North Pueblo of Taos, New Mexico (1882); Old Town, Concarneau (1887); Evening Near Edam, Holland (1888); Street in Algiers (1891); Wall of Kasba: Tangier (1894); St. Mark’s Square, Venice (1898). It appears that he spent a great deal between 1899 and 1901 in Europe painting works in Amsterdam, Switzerland, Holland, and France – and continued sending works to the Academy for exhibition. During this period he also visited far off places like Thailand and Burma … capturing the architecture of these exotic setting. Cooper became famous for his architectural works of art and as we have seen, traveled extensively in search of new and unusual subject matter. By 1904/05 he was back in the US and living in New York … where he spent almost 20 years painting the landscape and streets of the city. 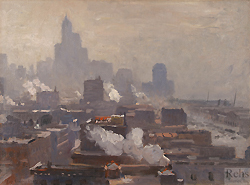 From 1904 – 1923 his exhibited works included: The Ferries: New York (1905); The Rush Hour: Brooklyn Bridge Entrance, New York (1907); The Blizzard, New York (1910); Lower Broadway (1918) and Chatham Square: New York (1921). 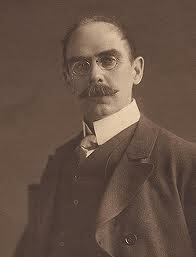 In 1908 he was elected an Associate member of the National Academy of Design and became a full member in 1912. The light and landscape of the West Coast also drew the artist’s attention and in c.1924 he moved to Santa Barbara, where he lived and painted until his death in 1937.